Raccoon Removal Vaughan. We guarantee a safe removal and exclusion of such wildlife from your property. Our skilled and licensed removal experts are trained to locate the access points used by raccoons and have them sealed permanently. Call us at 647-360-6046 and avail our guaranteed removal and control services right away! Raccoons mainly look for food and shelter. Along with invading your space and raiding your kitchen for food, raccoons cause extensive property damage. They chew on wires and insulation and the repair costs for these damages are an unwarranted problem. 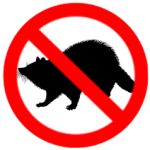 Raccoons gain access into your home through entry points created by them gnawing on your roofing or walls. Raccoons are known to possess a good memory, so they know and remember these entry and exit points for many years. When eradicating these annoying animals from your property, it is important to permanently seal these access points. It is best to seek professional wildlife removal services to have raccoons eradicated from your property. In urban areas raccoons are known to invade homes and offices. It is mostly the mother raccoon that gains entry into your home, so she can provide her little ones with food and shelter, especially during the winter season. Raccoons give birth to approximately 4 babies, or kits, at a time. In order to provide for her little ones, she raids your kitchen or garbage for food. Raccoons are even known to carry dangerous pathogens that threaten your health and the health of your family. These disease causing bacteria may be left behind on any food item or surface that raccoons come in contact with. Hence, as soon as you realize that you have a raccoon in your home, you need to call professional removal services to safely eradicate these bothersome creatures. Having raccoons invade your home could lead to a lot of additional expenditure as these wildlife animals gnaw off wires and insulation and cause extensive damages to your property. Once raccoons have made a comfortable spot in your attic, it is very difficult to get rid of them. But we at Raccoon Removal Vaughan think otherwise. Our expert staff is trained to trap these mammals and carefully remove them from your property. We also focus on locating their access points and sealing them permanently. This ensures no future invasion problems. Our staff at Raccoon Removal Vaughan have years of experience in trapping and safely removing raccoons. We investigate the level of invasion and also check for damages caused. Our staff will carry out the removal process effectively and also offer you control measures to keep these annoying animals at bay. Call us at 647-360-6046.